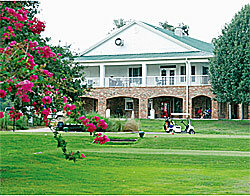 BERKELEY COUNTRY CLUB, located in Moncks Corner, South Carolina, has been played by golfers young and old since 1959, when it was first established as a nine-hole course. It was expanded to 18 holes in 1967. Designed by George Cobb, the course, which features Bermuda champion ultra dwarf greens, was recently renovated. Golfers who play the course are challenged by pine trees along the fairways, as well as by strategically Golfers who play the course are challenged by pine trees along the fairways, as well as by strategically placed ponds. Players who take a moment to relax during their round can often get a glimpse of fishing turtles, also relaxing in the sunshine at the edge of the ponds. Golfers can walk the semiprivate course or, if they wish, they can ride a cart. The facility includes a pro shop with a teaching professional, as well as a driving range, a chipping green and a practice bunker. The dress code prohibits tank tops or cutoffs. Tee times can be reserved up to a week in advance, and golfers can enjoy the full bar and snack bar after a challenging day of play. The club also offers tennis courts. Greens fees change with the seasons, with spring rates ranging from $22 to $35 on weekdays and from $24 to $40 on weekends. Senior discounts are available Mondays and Thursdays for golfers 55 or better, and all pricing includes cart fees. From the blue tees, Berkeley Country Club plays at 6,691 yards, while the course plays at 6,236 yards from the men-s tees, 5,665 yards from the senior tees and 4,933 yards from the ladies- tees.